IRONICALLY, this year's theme, "Translate Political Decisions into Concrete Actions at the Grassroots to Reach the Goal of Zero Tolerance to Female Genital Mutilation," hits home for the ruling party with a feel of grassroots edge. THE ORIGINAL DOMESTIC VIOLENCE Bill included a ban on FGM, but that was scratched out and it's not clear whether there will be a ban on FGM, despite a push from women's groups and civil society organizations. YOUNGSTERS LIKE Fourteen-year-old Latifatou Compaoré who learned the spirit of resistance from her mother who was subjected to FGM as a child in Burkina Faso. "She told me that one of the girls who had been cut the same day as her had experienced serious problems and died following a hemorrhage that no one had taken care of," Latty explained. SHARLEEN CHERPO, a 17-year-old Kenyan girl, like Latifatou also resisted and managed to escape both FGM and child marriage - which are linked in some places, with one practice considered a precursor to the other. "My family wanted me to be cut and get married, but I refused," Sharleen said. She ran away from home and found support and safety at a nearby school. She is now an advocate for children's rights. 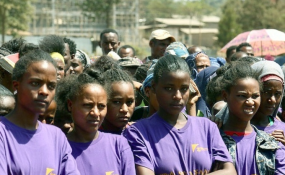 SOFIA HUSSEN, AN 18-year-old Ethiopian who experienced both FGM and child marriage, learned about the harms of both practices from a UNFPA-supported adolescent girls' group, and today she uses her own story to call for change. "I am a living example," she said of her work."